Description: LittleBits is a platform of easy-to-use electronic building blocks that empower you to invent anything, from your own remote controlled car to a smart home device. The kit consists of small circuit boards with specific functions built to snap together with magnets - without soldering, wiring, or programming. Each bit has its own specific function, such as light, sound, sensors, or buttons. 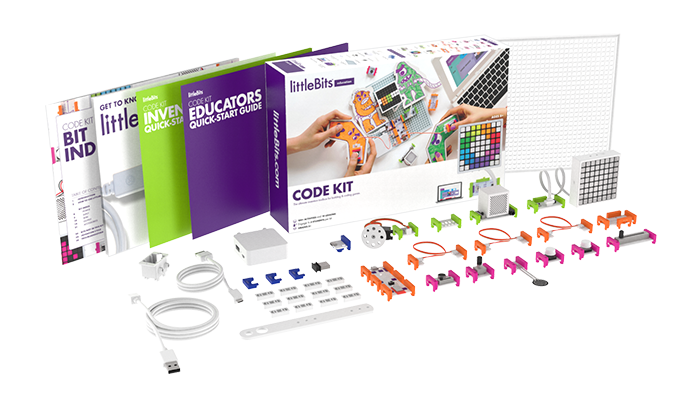 The littleBits library has over 70 modules and growing. Every module works with every other in millions of combinations, so you'll never run out of things to make! The littleBits mission is to "put the power of electronics in the hands of everyone, and to break down complex technologies so that anyone can build, prototype, and invent." Resources: Also included with all SWON Tech to Lend are online resources, including instructions & curriculum, which can be found through Google Drive here. SLJ Top Ten Tech 2016, TTPM 2016 Most Wanted: Educational STEM, Fast Company Innovation by Design Award 2016, Parents’ Choice Gold Award 2016, and more!